OSWEGO – The Oswego County Legislature’s Human Services Committee presented a proclamation to members of Oswego County Opportunities’ Services to Aid Families designating October as Domestic Violence Awareness Month. The proclamation shines a light on the misconceptions about domestic violence that persist in communities across the country, including the barriers that victims face in reporting abuse, their inability to “just leave,” and the unrealistic expectations of institutions meant to protect them. Estimates show that one in three U.S. women experience domestic or sexual violence with an average of three women dying each day at the hands of an intimate partner. Further, one in 15 children are exposed to domestic violence each year. Through education and awareness, advocates hope to empower survivors to regain their personal power and step into the light. 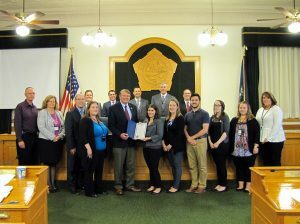 Pictured from left in the front row are STOP-DWI Program Coordinator Robert J. Lighthall; Oswego County Office for the Aging Director Sara Sunday; Oswego County District Attorney Gregory S. Oakes; Renee Earl, caseworker, Oswego County Department of Social Services; Committee Chairperson Roy E. Reehil, District 5; SAF Educator Sara Carmichael; SAF Program Manager Jackie Guglielmo; SAF Advocate Jake West; SAF Specialist Kristen Diment; Christie Bristol, caseworker, Oswego County DSS; and Elizabeth Teifke, CPS supervisor, Oswego County DSS. In back from left are legislators Daniel T. Farfaglia, District 24; Thomas Drumm, District 16; Tim Stahl, District 20; Committee Vice Chairman Bradley Trudell, District 7; and Nathan Emmons, District 15.